Gratuitous vintage Andy Virgil illustration, just because I can. Late to the party as always, I’m just now getting back to my blogging chores. So guess what greeted me when I opened my dashboard? Sweet Rocket exploded last week. All without my knowledge. The reason was, as it often is, totally random: over at BuzzFeed, one Julia Pugachevsky created an, um, interesting quiz about which Friends character one should hook up with. 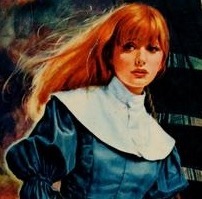 Said quiz included a link to an image in one of my all-time favorite Sweet Rocket posts, Hideous Romance Novel Covers, the Madeline Baker Edition. No, that makes no sense to me, but then I don’t ever remember watching Friends (before you toilet paper my house, I’m not a TV watcher, but I did love Seinfeld). Do go over and have a look and help me to understand how Madeline Baker and Friends are related. In the meantime, if a Friends quiz means a wider audience for the understated glory of a Madeline Baker romance novel cover, then carry on, BuzzFeed, carry on! Open Library Is Exploding, Too — With Vintage Romances! If you, like me, find that most of your romance reading is of the yellowed and crumbly variety, you’ll swoon when I drop this bomb on you: Open Library seems to be adding more vintage romance and vintage Gothic romance novels every flipping day! Seriously. I eliminated about 5o percent of the titles on my Amazon Wish List while waiting to exchange two frozen legs of lamb and a huge bag of clean laundry for a vintage Pioneer hi-fi receiver (thank you, Little Brother — when the receiver’s hooked up, you’ll be the first to be blasted with “Jerusalem” by Emerson, Lake and Palmer at 3:00 a.m. Wait for it). An Assortment of New Links in the Blogroll Awaits You! Sweet Rocket on Tumblr: Shameless self-promotion, yes, but for your own good, promise. 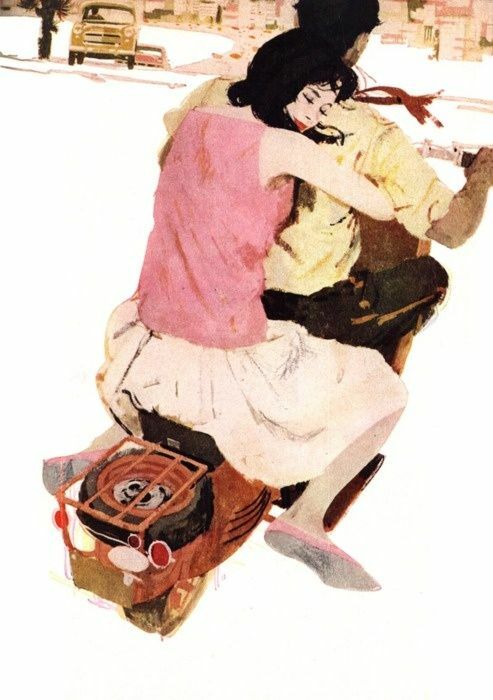 The Sweet Rocket Tumblr is where most of my romance ephemera ends up now, so if you Tumbl, do follow me there. There are a billionty bizarre romance novel covers, strange love letters, weird love songs and other romantic oddities for your enjoyment. Miss Bates Reads Romance: There is something infinitely pleasing about finding another person who loves to read what you love to read, and it’s pleasure ten-fold when that person writes about the books, and writes about them so well. Only a curmudgeon wouldn’t love Miss Bates’ reviews. Eight Ladies Writing: Reading about writers and writing makes one a better reader. The ladies at Eight Ladies Writing will inspire you if you aspire to write romance, or if you just love to read romance and enjoy a window into the creation of romance novels. The Regency Redingote: My love for all things Regency is well-documented; reading The Regency Redingote makes reading the Regency a richer experience. So much Regency-era history and ephemera, sigh… I can waste hours on this blog. Book’d Out: Shelley Rae (I hope I got the name right) at Book’d Out reads a dizzying array of books. She’s an Australian book blogger, and I like seeing what readers around the world are reading. Shallowreader: Shallowreader is a very special romance reader: a librarian! Another Australian blogger, Shallowreader reads and writes about more than just romance. I enjoy her insights into reading as a librarian and her reviews. SB James, Doing the Write Thing: Again, I love reading writers on writing, and SB James writes from a perspective that romance readers, especially, can appreciate: that of a self-published writer. A Writer Afoot: Barbara Samuel (aka Ruth Wind) is one of my all-time favorite writers of Harlequin/Silhouette titles, and I also love her historicals and single-title romances. Her writer’s blog is inspirational and aspirational. I am making myself accountable to you, dear readers, this year: if I promise you I am going to review more books, I hope some of you will send me nasty messages if I fail to do so. I’ve got a backlog of vintage Harlequin, historical, and Gothic romances I need to work through, but I’m going to start by reviewing Amanda DeWees’ Nocturne For a Widow, which I posted a teaser for back in the good old days of 2014. Look for that review this week. As for the rest, I entreat you: don’t let me be lazy. Categories: Bizarre Romance Novel Covers, Hideous Romance Novel Covers, Random, Social Media, Writing | Tags: a writer afoot, Amanda DeWees, Andy Virgil, Barbara Samuel, blogs, book'd out, BuzzFeed, eight ladies writing, Emerson Lake and Palmer, Friends, Jerusalem, Madeline Baker, miss bates reads romance, Nocturne For a Widow, Open Library, Ruth Wind, sb james, shallowreader, sweet rocket on tumblr, the regency redingote, vintage romance novels | Permalink. If you still haven’t checked out Open Library, what in the world are you waiting for, honeybun? A treasure trove of books both new and old are just waiting there for you! You can read them in a browser, on your tablet/smartphone/clay tablet-smartphone or on your (Adobe Digital Editions-equipped) ereader. FREE. I love Open Library for its mind-boggling selection of long out-of-print paperbacks. You truly wouldn’t believe the number of old Harlequins, Silhouettes and Signets available. I’ve whittled my infamous Amazon Wish List down by hundreds, no kidding. 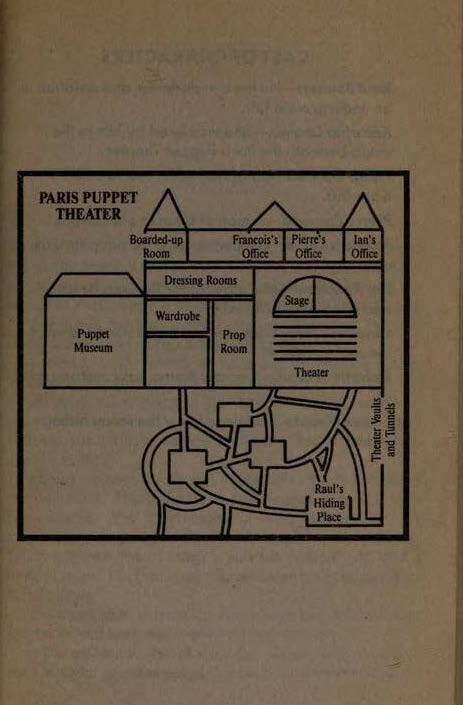 Hiding behind the gothic columns of the famed Paris Puppet Theater, Raul Sennett watched her. 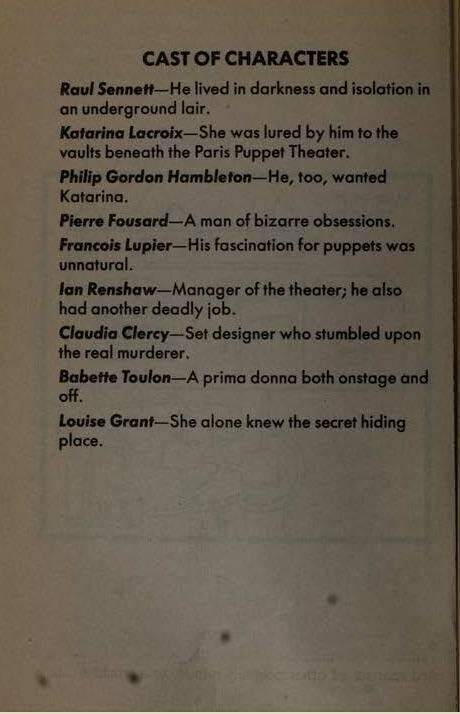 Katarina Lacroix was a vision of beauty and perfection as she performed onstage, mesmerizing the audience as a human puppet. He didn’t know how much longer he could wait to touch her, to be with her. Returning to his underground lair beneath the century-old theater, Raul cursed the dank vaults where he lived. The world of darkness and isolation had become his home, hiding him from the world above. In the shadows, secrets lurked — secrets that were the key to his freedom. And only one woman — Katarina Lacroix — could unlock the demons that were buried there. For Raul, they had to be unleashed. No matter what. When you need a map to a boarded-up room, a vault and a hiding place, plus fair warning that you’ll meet characters with bizarre obsessions, deadly jobs, and unnatural fascinations, you know you’re headed for nuclear-level insanity. I don’t know about you, but I’m pretty excited right about now. No, really. I’ve actually read several Jenna Ryan books, and have never been less than entertained. It’s almost as though she sets out to write the craziest books ever, and yet she has just enough talent to keep you from howling the whole time. She’s Anne Stuart-lite — seriously bizarre settings/plots, but without the genuine air of menace that Stuart usually delivers. 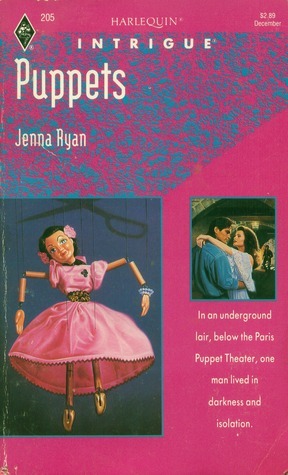 Categories: Cover Art, Hideous Romance Novel Covers, Open Library Find, Paperbacks, Rediscovered | Tags: Crazy, Jenna Ryan, Open Library, Puppets | Permalink.